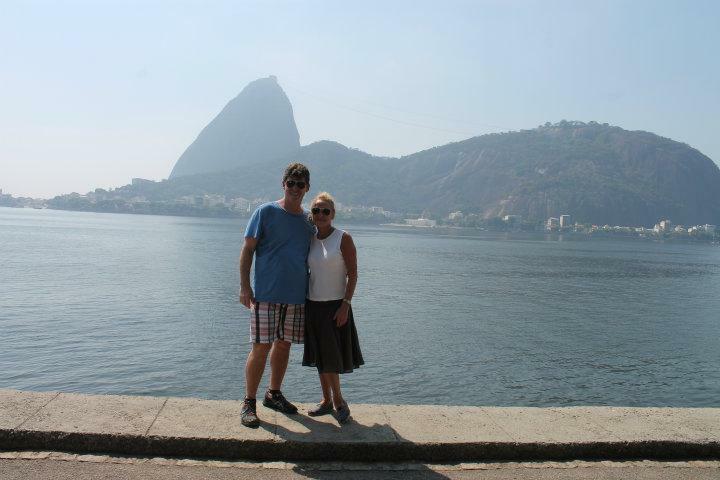 Sugarloaf Mountain (Pao de Acucar), Rio de Janerio - Blog from Urca, Brazil | South America!! As I thought we might, we learned! While there are a handful of small islands in the bay, most of the peaks we saw from Corcovado are islands not at all. They are in fact individual peaks that sit on peninsulas that line the crescent-shaped, almost circular Guanabara Bay (name source: woman's breast or a term meaning embracing the sea). Rio itself is nestled in valleys and in the space between mountains and the bay. Peaks are seen in any direction. Sugarloaf is the most obvious of these mountain peaks. Almost all photos of Rio de Janeiro feature a view of Sugarloaf. It sits 1,299 feet above the harbor, and its name is said to refer to its resemblance to the traditional shape of concentrated raw loaf sugar. While the view of Sugarloaf is famous and beautiful, rising bullet-shaped above the waters of the bay and the Atlantic, the view from the top of Sugarloaf is as amazing. The entire city can be seen. Our day was a bit hazy but we are told that we are lucky because on many days clouds block the panoramic view. A two-step cable car provides access to the top of Sugarloaf. The first section leaves from a station at the foot of Mount Babilonia near Red Beach to the top of Morro de Urca. From this point, a second cable car takes passengers to the top of Sugarloaf. The cable car system is very similar to the system we used to reach the top of Table Top Mountain last year in Cape Town. On the ride to the top of Urca Hill we could see climbers scaling the almost vertical side of Mount Babilonia - this area is said to be one of the most popular in the world for urban rock climbing. I try to be open minded about the sport, but I just cannot get past why????? We could see the entire area, the port, marinas, the city financial district, airports, beaches, Copacabana, Ipanema, LaBlon, Two Brothers Mountains, and Gavea Rock, the 2769 flat-topped granite mountain that looms over LeBlon beach. Next we toured the southern part of the city which included driving through several of the city's 19 tunnels. Obviously, where there are mountains, there are tunnels. We stopped at Sao Conrado to have a cool drink and watch the hang gliders swoop down from the top of Morro Cochrane. The launch ramp was situated about 2500 feet above us. A heavy cloud moved in over the top of the launching point, but as we watched, one or two colorful gliders would suddenly pop out of the clouds and soar down, floating left and right, catching rising air currents that enabled them to soar up and around again. The ride must be magnificent. I really had an urge to try it, tandem, of course. As the jump master expertly controlled the craft, the glider and guest in tandem would float down from the mountain, out over the ocean and ultimately fly along the beach, just feet above the sand to the exact designated location on the beach for a soft landing. I still get chills thinking about it! We said farewell of Renata. He was a great driver and teacher. We will miss him, our new friend. For the next two days in Rio, however, while we will be on our own, we are looking forward to minding our own schedule and making our own adventure.